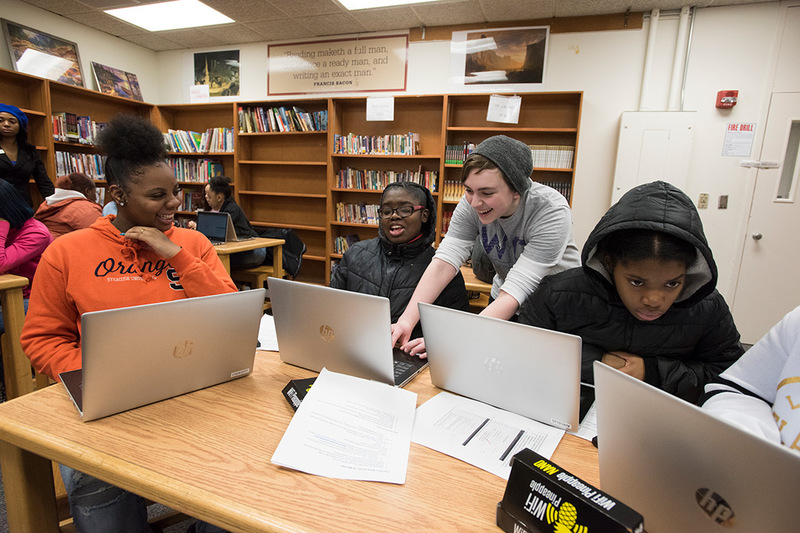 Jessi Miller, second from right, a first-year computer science student, works with students at the Northeast College High School, Douglass Campus as part of the RIT & AT&T Mobile Tech Lab. In hopes of inspiring more area K-12 students to pursue careers in technology, RIT’s Women in Computing group is bringing technology workshops to Rochester city schools as part of the new RIT & AT&T Mobile Tech Lab. The traveling hands-on lab will visit three Rochester schools this winter and spring to teach high school students about programming, project-based learning, hardware and more. The extracurricular lessons will be taught by Rochester Institute of Technology students, while laptops and gear for the lessons will be available because of support from AT&T. A. 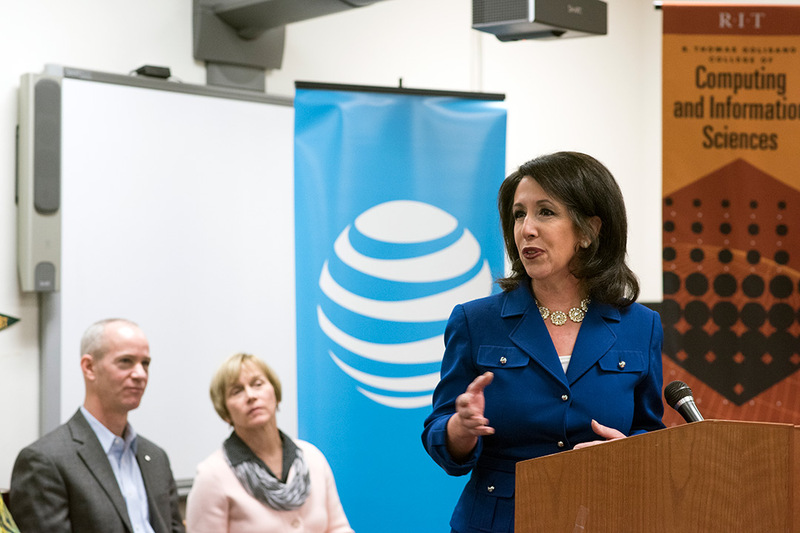 Sue Weisler Monroe County Executive Cheryl Dinolfo speaks during the launch of the RIT & AT&T Mobile Tech Lab as Kevin Hanna, left, director of external affairs at AT&T and Anne Haake, dean of Golisano College of Computing and Information Sciences look on. The RIT & AT&T Mobile Tech Lab was launched Feb. 26 at the Northeast College High School, Douglass Campus, the first school to receive the free multi-week program for its students. Monroe County Executive Cheryl Dinolfo took part in the rollout of the mobile coding lab and joined students trying out some of the workshop technology. The lab was born out of a common goal of RIT’s Women in Computing (WiC) and AT&T to provide more students in-depth STEM and computer coding educational opportunities throughout the region. Members of RIT’s WiC developed and will teach the STEM and coding lessons for the lab, which will be offered to the schools at no cost. Hardware and intro to programming—where students learn to code in Python (a very basic coding language), how to code and create emojis, and even how to solder. Networking—focusing on how computers communicate with each other using the Pineapple WiFi teaching environment. Students will also learn how to create mockup networks and how to keep information safe online. App Development—students will learn the basics of app making, learning drag and drop programming to build and program games. They will also learn design and creative programming techniques to create a very basic form of a Snapchat-like mobile app. Shannon McIntosh, an RIT student helping to lead the workshops, said that she doesn’t like how other programs for young students typically only focus on programming. Students will engage in activities that introduce them to the basic principles of coding, engineering, project-based learning, manufacturing, production skills, as well as the creative design process and critical thinking skills. The lab will bring laptops, Android phones, soldering kits, Pineapple WiFi’s and Circuit Playgrounds (micro-processors) to each of the schools for students to use during the workshops, in order to eliminate any economic barriers. The RIT & AT&T Mobile Tech Lab aims to help create a future of smart, innovative applicants to fill technology jobs in the region where supply is much smaller than the demand. According to the Bureau of Labor Statistics, it is estimated that by 2020 there will be 2.4 million unfilled STEM jobs in the U.S. More than half of this growth will be made up of computer careers. AT&T’s $20,000 contribution for this digital educational initiative is part of the company’s legacy of supporting educational programs focused on STEM disciplines in New York state through AT&T Aspire, the company’s signature $450 million philanthropic initiative that drives innovation in education by bringing diverse resources to bear on the issue including funding, technology, employee volunteerism and mentoring. Aspire is one of the nation’s largest corporate commitments focused on school success and workforce readiness by creating new learning environments and educational delivery systems to help students succeed and prepare them to take on 21st century careers. AT&T has given more than $103 million to support STEM initiatives. Projects supported by AT&T contributions range from after-school programs and camps for students at risk of dropping out to hands-on technology labs and elite robotics competitions. WiC, which is part of RIT’s Golisano College of Computing and Information Sciences, is dedicated to promoting the success and advancement of women in their academic and professional careers with an ultimate goal of empowering women in computing fields to succeed and thrive in the technology industry. The group was able to connect with Rochester City Schools for this workshop because of GEAR UP and the RIT K-12 University Center. GEAR UP (Gaining Early Awareness and Readiness for Undergraduate Programs) is part of a national grant program to increase the number of low-income students who are prepared to enter and succeed in higher education. RIT’s K–12 Division manages a grant for students in the class of 2020 within the City of Rochester, providing or coordinating once-in-a-lifetime experiences, leadership training, personalized mentoring, tutoring and college and financial aid planning. In the future, the WiC group hopes to make the workshop mobile by getting a van that allows it to spread the word beyond the Rochester-region.